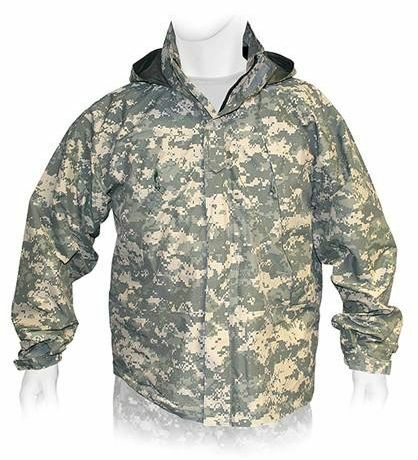 The jacket and trousers are designed for use in cold, wet conditions alternating between freezing and thawing as a hard shell layer combined with other base and insulative layers. The jacket and trousers provide a lightweight, completely waterproof, windproof and breathable level of protection against the elements. 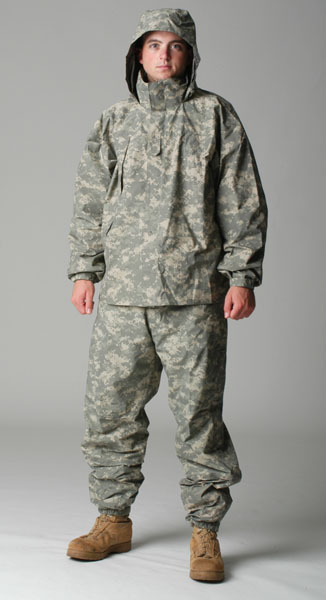 The jacket features a center-front slide fastener with two slide fastener and two pass-through front middle pockets, a visored hood with hook and loop for back adjustability, an elastic cord-lock tunnel in the front and a hide-away collar which the hood can be stowed in; and elastic cuffed sleeves with a hook and loop tab for further adjustability. The trousers feature a fly slide fastener, two pass through pockets with hook and loop flaps for water protection, 3/4 leg (starting from the bottom) side zippers with a hook and loop flap cover for easy access when donning over other layers or boots and elastic cuffs with a strap for adjustability. The waist is constructed with an elastic cord with barrel locks for adjustability, belt loops and provisions for suspenders. The jacket and trousers are constructed with two-layer GORE-TEX fabric developed based on the technology of GORE-TEX Paclite Shells.